PAN was the god of shepherds and the mountain wilds. He was worshipped primarily in the highlands of the Peloponnese where rustics tended herds of goats. The traditional center of his cult was Mount Mainalos in Arkadia. 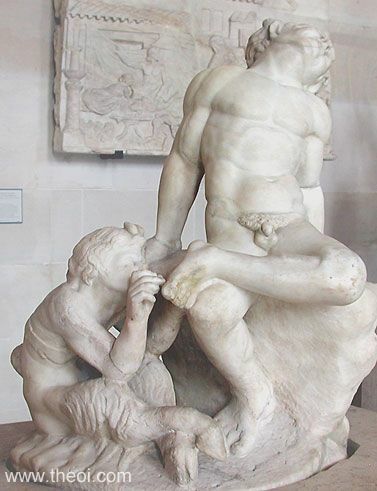 In classical sculpture Pan was depicted as a goat-legged and horned man with bestial facial features. 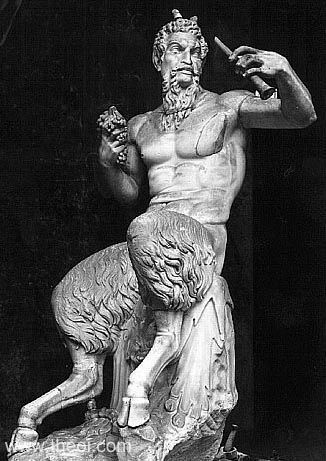 In the Roman era he was sometimes portrayed as a youth with just a small pair of horns to suggest his goatish nature. The Athenians believed that Pan came to their rescue in their historical war with the Persians and founded a temple in his honour. "Goat-footed Pan, the Arkadian, ememy of the Medes (Persians), ally of the Athenians, [he was believed to have created panic in the army of the Medes attacking Athens] was set up by Miltiades [a statue]." "While [the Athenians were] still in the city [at the start of the Persian War], the generals first sent to Sparta the herald Philippides, an Athenian and a long-distance runner who made that his calling. As Philippides himself said when he brought the message to the Athenians, when he was in the Parthenian mountain above Tegea he encountered Pan. Pan called out Philippides' name and bade him ask the Athenians why they paid him no attention, though he was of goodwill to the Athenians, had often been of service to them, and would be in the future. The Athenians believed that these things were true, and when they became prosperous they established a sacred precinct of Pan beneath the Akropolis. Ever since that message they propitiate him with annual sacrifices and a torch-race." "A little further on [from Tegea, Arkadia] is a sanctuary of Pan, where the Athenaians and Tegeans agree that he appeared to Philippides and conversed with him." "In the aftertime [Pan] shall help the Athenian battle, he shall slay the Medes and save shaken Marathon." "Haliplanktos (Sea-roaming) : Thus Pan is called, either because he aided the Athenians in the sea-battle, or because he hunted Typhon with nets, or because seamen honour Pan as an established god, or because [he is] loud-voiced in the dance, roaring like the sea, or because he is in love with Ekho; the sea is noisy. Pan is the patron of dances." "Hippias : [Battle of Marathon.] Pan met up with Philippides as he was going back across the Parthenion mountain in Arkadia and faulted the Athenians, by whom he alone of all the gods was neglected, and promised to support them in battle. After one man had advised--for they were ten--waiting for the Lakedaimonians, but with Miltiades and then Kallimakhos recommending that they go forth, the Athenians went out, themselves being nine thousand and having one thousand Plataians [in support]. And they say they won that same day. Among these Kallimakhos fell dead by the spear, and Polyzelos, after being blinded when a phantom appeared who had a beard which shaded his shield (they suppose him to be Pan as ally), fought as if he saw, and distinguished the enemy and his own side by voice." "And in the neighborhood of Anaphlystos [in Attika] is also the shrine of Pan." "A little beyond the plain [of Marathon, Attika] is the Hill of Pan and a remarkable Cave of Pan. The entrance to it is narrow, but farther in are chambers and baths and the so-called ‘Pan's herd of goats,’ which are rocks shaped in most respects like to goats." "[The sanctuary of Amphiaraus in Oropos, Attika :] The altar shows parts . . . The fifth is dedicated to the Nymphai and Pan, and to the rivers Akheloos and Kephisos." "Opposite Salamis there is an island [Psytalleia]--small, useless for anchorage--where Pan the Dancer treads along the briny shore." "The island [of Psyttalea, near Salamis] has no artistic statue, only some roughly carved wooden images of Pan." "The enclosure of Akslepios [at Sikyon] . . . Within the sanctuary on either side of the entrance is an image, on the one hand Pan is seated, on the other Artemis is standing." "[At Sikyon] is built an altar to Pan, and one to Helios (Sun) made of white marble." "To the Silenoi's mates that dwell in caves [i.e. the Nymphai], and to their chieftain, horned Pan Akrorites, a scatheless head and this new boarskin, that not even steel has rent, were hunt up by Glenis, son of mighty Onasiphanes, who showed these thank-offerings for a fine quarry." "At the places [in Argos] where the river Erasinos gushes forth from the mountain [Khaon] they sacrifice to Dionysos and to Pan." "Coming down from here [the citadel of Troizenos, Argos] you come to a sanctuary of Pan Lyterios (Releasing), so named because he showed to the Troizenian magistrates dreams which supplied a cure for the epidemic that had afflicted Troizenia and the Athenians more than any other people." "One entering the Wedge itself [at Olympia] you see altars of Tykhe (Good Luck), Pan and Aphrodite." "Before what is called Theekoleon [at Olympia] is a building, in a corner of which has been set up an altar of Pan . . . In the town-hall itself, on the right as you enter the room where they have the hearth, is an altar of Pan." "Panikoi deimati (in Panic terror) : Women used to celebrate customary rites for Pan by shouting. And Menandros in Dyskolos [says] : ‘One must not approach this god in silence.’ Or because they attributed to Pan things [that happen] for no reason; for example, the enemy seems to attack; and [the soldiers] pick up their weapons in the commotion, form ranks, and attack one another." "The Erymanthos [river of Arkadia] has its source in Mount Lampeia, which is said to be sacred to Pan." "There is also in Heraia [in Arkadia] a temple of Pan, as he is native to Arkadia." "[Inside the temple of Zeus at Megalopolis, Arkadia is] an image of Pan made of stone. His surname is Sinoeis, and they say that Pan was so surnamed after a Nymphe Sinoe, who with others of the Nymphai nursed him on her own account." "[At Megalopolis, Arkadia is] a bronze Pan, surnamed Skoleitas, one cubit high. It was brought from the hill Skoleitas." "[At Megalopolis, Arkadia] is an enclosure sacred to the Great Goddesses [Demeter and Persephone] . . . Before it stands a table, on which are carved two Horai (Seasons), Pan with pipes, and Apollon playing the harp. There is also an inscription saying they are among the first gods." "[At Peraithenses, Arkadia] is a sanctuary of Pan." "Mount Mainalos [in Arkadia] is held to be especially sacred to Pan, so that those who dwell around it say that they can actually hear him playing his pipes." "Maenalian fields [Arkadia] [worship] pine-crowned Faunus [Pan]." "[At the sanctuary of Despoine, Arkadia] you will ascend by stairs to a sanctuary of Pan. Within the sanctuary has been made a portico, and a small image; and this Pan too, equally with the most powerful gods, can bring men's prayers to accomplishment and repay the wicked as they deserve. Beside this Pan a fire is kept burning which is never allowed to go out. It is said in days of old this god also gave oracles, and that the Nymphe Erato became his prophetess, she who wedded Arkas, the son of Kallisto." "There is on Mount Lykaios [in Arkadia] a sanctuary of Pan, and a grove of trees around it, with a race-course in front of which is a running-track. Of old they used to hold here the Lykaion games." "On the right of Lykosoura [in Arkadia] are the mountains called Nomia, and on them is a sanctuary of Pan Nomios; the place they name Melpeia, saying that here Pan discovered the music of the pipes. It is very obvious conjecture that the name of the Nomia Mountains derived from the pasturings (nomia) of Pan, but the Arkadians themselves derive the name from a Nymphe." "On the left of the road as you go from Tegea [in Arkadia] to Lakonia there is an altar of Pan." "[By the river Garates, near Tegea, Arkadia is] a sanctuary of Pan, by which is an oak, like the sanctuary sacred to Pan." "A little further on [from Tegea, Arkadia] is a sanctuary of Pan, where the Athenaians and Tegeans agree that he appeared to Philippides [see Cult of Pan in Attika] and conversed with him. Mount Parthenios rears also tortoises most suitable for the making of harps; but men on the mountain are always afraid to capture them, and will not allow strangers to do so either, thinking them to be sacred to Pan." "In Arkadian territory there is a shrine of Pan; Aule is the name of the place. Now any animals that take refuge there the god respects as suppliants and protects in complete safety. For wolves in pursuit are afraid to enter it and are checked at the mere sight of the place of refuge. So there is private property for these animals too to enable them to survive." "The Korykian cave [near Delphoi, in Phokis] exceeds in size those I have mentioned, and it is possible to make one's way through the greater part of it even without lights. The roof stands at a sufficient height from the floor, and water, rising in part from springs but still more dripping from the roof, has made clearly visible the marks of drops on the floor throughout the cave. The dwellers around Parnassos believe it to be sacred to the Nymphai Korkykiai, and especially to Pan." "The exile Evander came from Arcadia to Latin fields, and ferried his gods here. Where Rome is now, the world's head, were trees and grassland, a few cattle, an occasional hut . . . 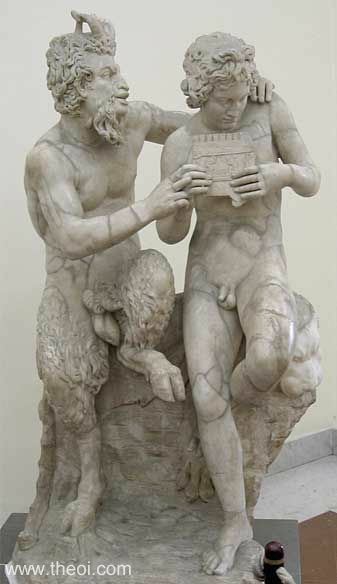 He taught the tribes man sacred rites, but firstly those of horned Faunus [Pan] and the wing-foot god [Hermes]. The Luperci in loincloths serve you, half-goat Faunus, when their hide-strips purify the packed streets." Pan had a number of cult titles, most of which described his divine functions. Greek Lyric III Simonides, Fragments - Greek Lyric C6th - 5th B.C. Aeschylus, Persians - Greek Tragedy C5th B.C. Greek Papyri III Leonidas, Fragments - Greek Elegiac C2nd B.C. Greek Papyri III Antipater of Sidon, Epigrams Fragments - Greek Epic C1st B.C.